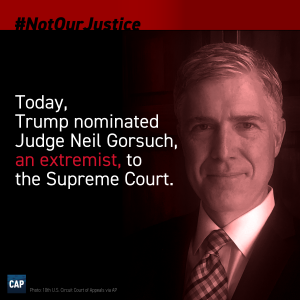 In addition to being a far right ideologue who would, if confirmed, do his utmost to roll back critical constitutional rights, Donald Trump’s nominee for the Supreme Court Neil Gorsuch is also, quite apparently, a two-faced politician. How so, you ask? Well, consider the nominee’s recent reaction to Trump’s latest attack on the judiciary in the aftermath of the striking down of his unconstitutional immigrant ban. As you will recall, the Prevaricator-in-chief issued an attack on the heroic federal judge (a Bush appointee, for heaven’s sake) who struck down his ban, characterizing him as a “so-called judge.” In response, Gorsuch apparently offered some mild criticism of Trump. While welcome on one level, here’s the problem with Gorsuch’s response: the man was just standing next to Trump a few days ago saying what a great guy he is and accepting his nomination. Did he just figure out now that Trump is a lying charlatan? As the same N&O editorial points out, Trump attacked another judge last summer by alleging that his Mexican heritage biased him. And, of course, the list of Trump’s outrages is as long as your arm. How convenient that Gorsuch is criticizing Trump now, after his nomination has already been submitted. In this respect, Gorsuch’s behavior is emblematic of scores of conservative politician — from John McCain to Lindsay Graham to Richard Burr to Thom Tillis — who know Trump is an immoral liar and a threat to the the nation, but who constantly muzzle themselves for fear of harming their own political careers. Rather than having the courage to stand up to Trump — really stand up to him in public — these craven politicians send occasional signals behind closed doors or in obscure meetings that they know will be received well by their friends in the national media without jeopardizing their support amongst the far-right Trump crowd that they suppose they need to stay in office. All in all, it’s a thoroughly shameless approach to life in public office — one that puts personal political success ahead of national security (and what a person knows to be morally right) and that signifies a brand of fundamental dishonesty. In the case of Gorsuch, it ought to be more than enough reason for his nomination to be summarily rejected.